of the pump as a result. Boiling starts when the pressure in the liquid is reduced to the vapor pressure of the fluid at the actual temperature. *) We can not measure the suction head "close to the impeller". In practice we can measure the head at the pump suction flange. Be aware that - depending of the design of the pump - the contribution to the NPSH value from the suction flange to the impeller can be substantial. Note! The vapor pressure in a fluid depends on the temperature. Water, our most common fluid, starts boiling at 20 oC if the absolute pressure is 2.3 kN/m2. For an absolute pressure of 47.5 kN/m2 the water starts boiling at 80 oC. At an absolute pressure of 101.3 kN/m2 (normal atmosphere) the boiling starts at 100 oC. The Net Positive Suction Head available from the application to the suction side of a pump is often named NPSHa. 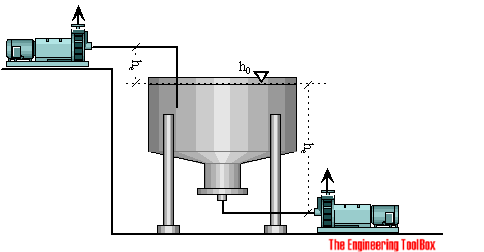 The NPSHa can be estimated during the design and the construction of the system, or determined experimentally by testing the actual physical system. The available NPSHa can be estimated with the Energy Equation. For a closed pressurized tank the absolute static pressure inside the tank must be used. If the pump is positioned above the tank, the elevation - he - is positive and the NPSHa decreases when the elevation of the pump increases (lifting the pump). At some level the NPSHa will be reduced to zero and the fluid will start to evaporate. If the pump is positioned below the tank, the elevation - he - is negative and the NPSHa increases when the elevation of the pump decreases (lowering the pump). It's always possible to increase the NPSHa by lowering the pump (as long as the major and minor head loss due to a longer pipe don't increase it more). Note! It is important - and common - to lower a pump when pumping a fluid close to evaporation temperature. The NPSHr, called as the Net Suction Head as required by the pump in order to prevent cavitation for safe and reliable operation of the pump. The required NPSHr for a particular pump is in general determined experimentally by the pump manufacturer and a part of the documentation of the pump. 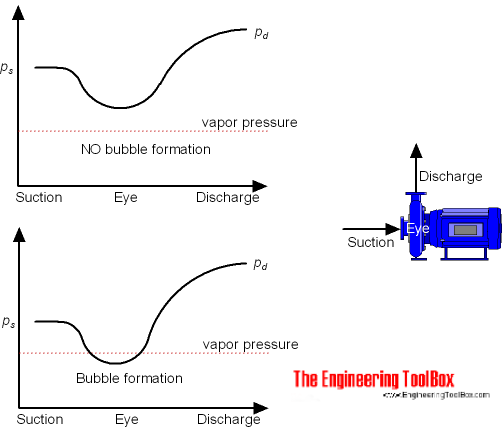 The available NPSHa of the system should always exceeded the required NPSHr of the pump to avoid vaporization and cavitation of the impellers eye. The available NPSHa should in general be significant higher than the required NPSHr to avoid that head loss in the suction pipe and in the pump casing, local velocity accelerations and pressure decreases, start boiling the fluid on the impellers surface. Note that required NPSHr increases with the square of capacity. Pumps with double-suction impellers has lower NPSHr than pumps with single-suction impellers. A pump with a double-suction impeller is considered hydraulically balanced but is susceptible to an uneven flow on both sides with improper pipe-work. When elevating a pump located above a tank (lifting the pump) - the fluid starts to evaporate at the suction side of the pump at what is the maximum elevation for the actual temperature of the pumping fluid. The maximum elevation - or suction head - for an open tank depends on the atmospheric pressure - which in general can be regarded as constant, and the vapor pressure of the fluid - which in general vary with temperature, especially for water. Due to head loss in the suction pipe and the local conditions inside the pump - the theoretical maximum elevation normally is significantly decreased. Maximum theoretical elevation of a pump above an open tank at different water temperatures are indicated below. Note that the NPSH specifications provided by manufacturers in general are for use with cold water. For hydrocarbons these values must be lowered to account for vapor release properties of complex organic liquids. 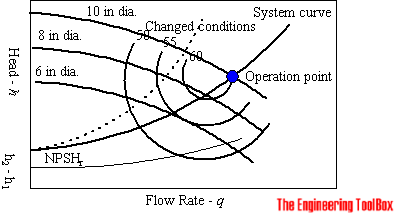 The head developed by a pump is independent of liquid and a performance curve for water can be used for Newtonian liquids like gasoline, diesel or similar. Note that the required power to the pump depends on the liquid density and must be recalculated. NPSH calculations might be modified if there is significant amount of dissolved gas in a liquid. The gas saturation pressure is often much higher than a liquid's vapor pressure. Engineering ToolBox, (2004). NPSH - Net Positive Suction Head. [online] Available at: https://www.engineeringtoolbox.com/npsh-net-positive-suction-head-d_634.html [Accessed Day Mo. Year].